Hair Restoration Training, FUE Course @ Practice Training > Welcome to HTTC! Welcome to the HTTC – Hair Transplant Training Center! Welcome to the HTTC in Ankara – Turkey! 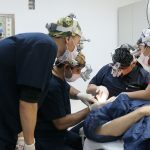 HTTC presents professional and complete Hair transplant training, Fue workshops and Hair transplant courses for attendants and trainees to receive hands-on-practice in contemporary techniques for hair transplantation. 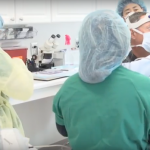 Aspiring doctors and physicians will be introduced to modern methods for hair restoration. Leading experts and awarded hair surgeons are proud to pass on their knowledge, experience and personal skills to new physicians in professional training courses to qualify for fue hair transplant. Medical staff training (technician – technicians training) and assistant programs will be arranged for clinics in specific packages. The HTTC – Hair Transplant Training Center (read more “About the HTTC”) in Ankara / Turkey with Doktor Özgür, Dr. Akin, Dr. Kaan, Gökhan Dogan from the Hairline Clinic, Dr. John Peter Cole – USA and the independent counseling center Hairforlife – Switzerland combined all her knowledge and know-how to provide the future hair surgeons the best foundation and knowledge in order to achieve best hair transplantation results and to obtain for the future hair surgeons as many satisfied patients as possible. The Training Center offers hair transplant training for doctors, hair transplant course, FUE Workshop, training for technicians, professional courses and programs using the latest technologies and offering fue hand-on-practice training (surgery live training) with modern medical instruments for hair transplant (read more about “Introduction – Objectives”). Training Attendants can opt for different qualification degrees to benefit from distinguished techniques and methods of famous and successful hair surgeons worldwide (read more about “Information – Course Outline“). HTTC in Turkey – Ankara offers FUE Education, FUE Workshop, FUE course, training courses for doctors, physicians, but also for their technician – technicians. A “Certificates of participation” will be awarded to every participant of the fue workshop, training (education) program and course. Every certificate will be confirmed by the hair surgeons of the Hair Transplant Training Center (read more about “The Certificate of participation”. Extend your skills – Individually. Practically. Concentrated! Follow us for more information about hair transplantation training and gain expert skills to achieve excellent results with patients in hair restoration. Read more about “Schedule and Registration”. The laws in India accept – similar to Turkey – to practice on actual and genuine patients. May exactly this is the reason that so many physicians – doctors are searching for hair transplant training courses in India. Also for clinics in India – same as in Turkey – it is much more easy to get patients who accept a practice training on them as example in United Kingdom (UK, England, Scotland, Wales, Ireland), Germany or other countries in Western Europe. But because many physicians – doctors would like to train on actual and genuine patients to gain experience this will be the the reason why many doctors and physicians from the UK, Germany, Belgium or other countries are searching for hair restoration training (courses) in india instead of searching as example for hair transplant training courses in uk – united kingdom. With the location from the Hair Transplant Training Center in Turkey in southeast Europe and can be reached quickly by airplane from United Kingdom – UK, Germany, Belgium and other countries.